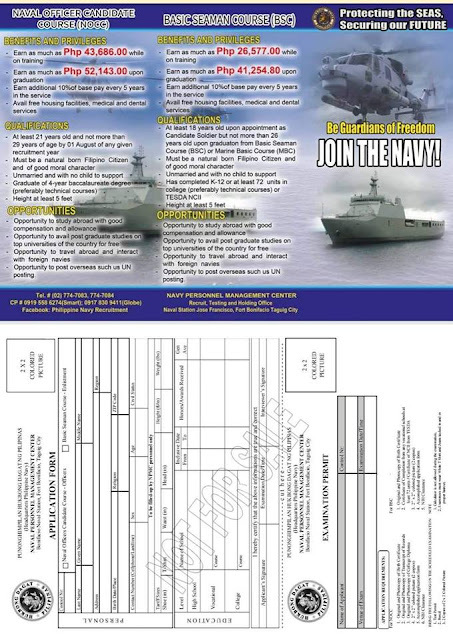 Navy To Conduct Recruitment Drive in Zamboanga #AFPSAT #NOCC - Exam News, Reviewer, Military Career, & Everything [MN] . .
To all Zamboangeños, the long wait is finally over! The Philippine Navy Mobile Recruitment Team is scheduled to conduct an AFP Service Aptitude Test (AFPSAT) Exam on October 08-12, 2018. We are also accepting walk-in applicants from 7:00-8:00 am on the above-mentioned dates. IF YOU WANT TO SEE THE WORLD, JOIN THE NAVY NOW!